Check out this bag-shot. It looks like something from a travel magazine. 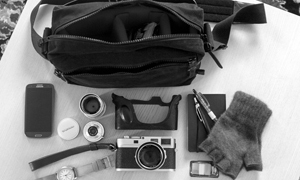 And it kind of is a travel bag, as Rob put this together for a little trip around his home country of Germany. Check it out. Heading to Berlin for a weekendtrip, i just wanted to share my travelbag with you. … first of all the cameras: My main-camera, the Leica M6 with the Canon 50 1.2 LTM + M39 to Leica M Adapter. 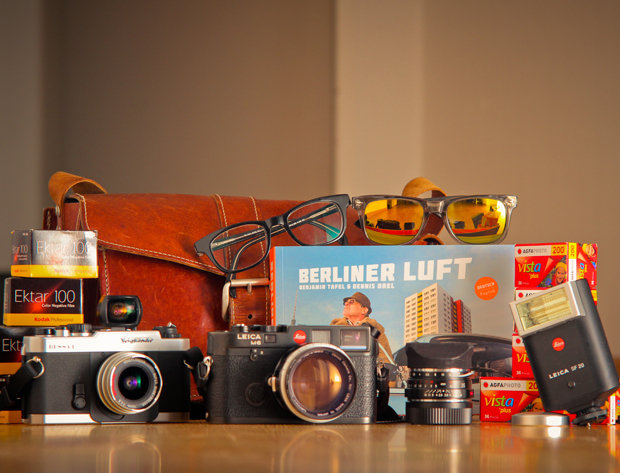 I will also carry a Voigtländer 35 1.4 Leica M, my second lens, with me. Mounted with a 3D-printed lenshood. My second camera is the Voigtländer Bessa L with the Super Wide Heliar 15mm, for the wide scenes. … the film: I chose 6 Kodak Ektar 100 (for the Leica) and 5 Agfa Vista 200 (for the Voigtländer), good weather expected. …. my glasses: of course sunglasses, itʻs summer! And my normal glasses. 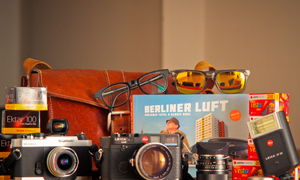 …a guidebook ‘Berliner Luft’, this is a photobook and guidbook in one. 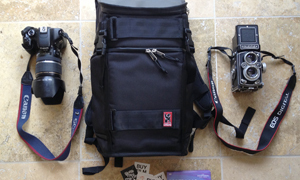 ….the rest: Of course a bag (the old one off my dad). A 15mm viewfinder. The Leica SF 20 flash. Lenscaps for all lenses. A variable ND-Filter to shoot the Canon all way open. Thanks for sharing your bag with us Rob. I love the layout and the description. I hope that you had a lovely weekend trip. 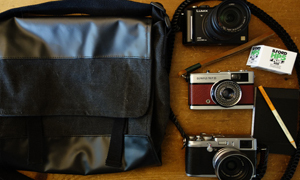 Great bag, and almost exactly what I took on a recent vacation to…Stuttgart (!) (and Helsinki). I brought a Leica M6 0.58 TTL with 35 pre-ASPH lens, and a Bessa T with 28mm f3.5 Skopar. And I almost brought my 15mm but did not this time. Wish we’d met up, perhaps at the Porsche Museum. Next time, ok? I love these small world coincidences. I have the Bessa L and CV15. A killer combination. 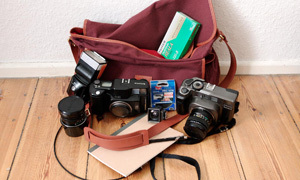 Nice bag for a little weekend outing, would you happen to still have the file of that lense hood ? Sweet set! How’s the 3D hood? I’m thinking of picking one up. You can find the hood here, it is just beautiful and much better than the metal One.